Application was exceedingly sheer, meaning I still have visible nail lines, and … it’s pink. 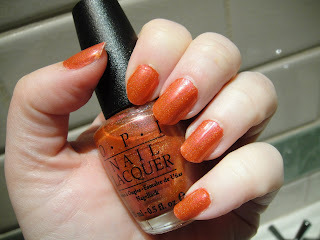 Not this orange shade you see here under my halogen lights, and not the crimson you assume from the name. It’s pink. Fuschia-pink under most lights. Not a bad colour, as it happens, but not what I wanted! Also, the holograph-effect is barely visible on the nail. It’s a nice polish. But not a great one. I like it, but I don’t love it. It’s also started to chip after about 18 hours on the nail. Boo! 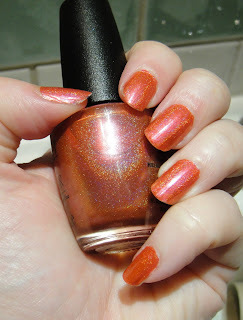 Holographic polishes are notoriously chippy though, so maybe that’s me being picky. I bought mine from eBay. ooh that is not the colour I expected to see when I clicked on the link! However, I really do like the colour it looks in the photos. Shame it's not like that in real life. 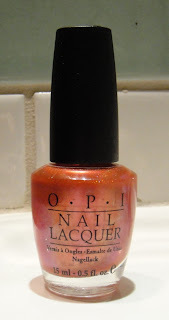 I had one of these… they're from a very old OPI collection I think. 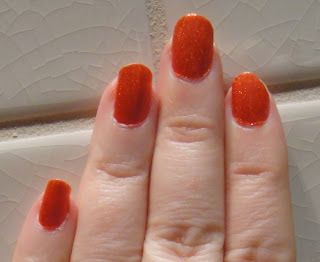 I didn't like it on me, ironically it was too orange for my liking, so I swapped it! It looks nice to me! But I haven't seen it in person, and am not a fan of fuchsia generally. It crossed my mind that this may be an eBay fake, if the colour and quality are not what you expected?